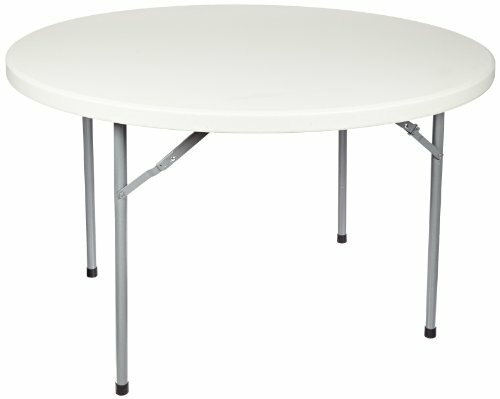 The National Public Seating BT-R Series steel frame round blow molded plastic top folding table has a speckled gray, 48" diameter, 2" thick, UV protected, blow molded plastic round table top, a gray steel frame that can support 700 lb. of evenly distributed weight, and folds for compact storage when not in use. The blow molded plastic top has a better strength-to-weight ratio than solid plastic or wood tables, is UV protected to withstand sunlight during outdoor use, and can withstand heat up to 212 degrees F so it won't be damaged by hot plates or coffee cups. The surface is lightly textured to increase scratch resistance, but is still smooth enough to write on. The gray steel legs are powder coated for corrosion resistance. When the legs are opened, snap locks engage automatically to keep them opened, releasing with a push button for folding. When folded, the legs nest flush into indentations in the bottom of the table, making a flat surface suitable for stacking multiple tables for compact storage. Plastic glides on the feet help protect floor surfaces. The table is Materials Analytical Services (MAS) certified as low volatile organic compound (VOC) emitting furniture according to the criteria defined by U.S. Green Building Council (USGBC) Leadership in Energy & Environmental Design (LEED) 2009 for Schools, LEED 2009 for Commercial Interiors, ANSI/BIFMA X7.1-2011, ANSI/BIFMA e3-2011e Furniture Sustainability Standard - Section 7.6.1 and 7.6.2, Collaborative for High Performance Schools (CHPS) EQ2.2.5, and the MAS Certified Green program. This table meets the Americans with Disabilities Act of 1990 (ADA) Standards for Accessible Design. If you have any questions about this product by NPS, contact us by completing and submitting the form below. If you are looking for a specif part number, please include it with your message.